1. A puppy to call my own. Year after year, I remember praying on Christmas Eve that a little bundle of fluffy fur, wrapped in a Christmas bow would clumsily jump on my bed and wake me up Christmas morn with puppy breath and a wet tongue. Year after year, I was greeted with a full stocking and presents from Mom & Dad, (and of course Santa), but never a puppy. Sure, we had a dog...but I wanted a puppy of my own. 2. To adopt. ... a human. I have always been inspired by adoption stories, and am excited to, in the VERY far future, have our own story and welcome a child into the Griffin family. But for now, my love of adoption is limited to rescuing animals. On Monday, I mixed these two wants as my adolescent dreams of a puppy came into fruition through the adoption of Bixby Griffin. And so, without further ado...The Adoption Story of BIXBY GRIFFIN. Part 1. Byron and I had decided that we wanted to be a multi-dog family long before we exchanged vows. We are dog lovers. We obsessively share pictures and stories of rescue dogs to one another. We plan names for future dogs like most do for their future children. We are passionate about offering our love and home to tail-waggers. This is Ralph, who inspired our search, which led us to Bixby, the world's most perfect rescue pup. Two Wednesdays ago, I arrived to work to find a sweet scruffy puppy outside the employee entrance. Immediately, tears welled up. Not because of the dog's condition, but because, as stated above, I have an irrational love of puppies and often cry upon seeing them. Other coworkers went inside, but I stayed and bent down to play with this little ball of fur and send videos to Byron. 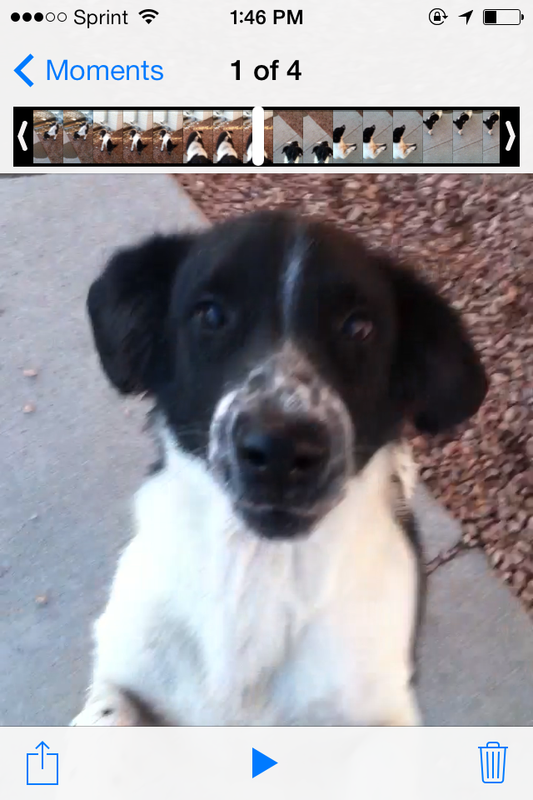 As if it was an emergency, we began to rapidly text about the possibility of adopting him and giving him a good home. Had people been watching us, I'm sure they would have found our frantic thumb action, tapping the keyboards of our phones, to be humorous. During this frenzy, a co-worker came to my office to ask if I would be wanting to take the dog myself or if they should call the humane society. I couldn't take a puppy home then, so I said "make the call," with a heaviness in my voice and a lump in my throat. We decided to arrange a visit to the humane society shelter later that day, only to find out Ralph,--the name I had already bestowed upon him--wouldn't be available to be seen for 3 days. 3 days?!? We wanted a puppy now! We also were told that this little stray had some corgi in him. (Byron hates this part of the story.) Upon learning this, B said "CORGI?! He's going to have short legs...so, I don't think I'm interested anymore." Yeah...he said that. We decided that this little cutie would go quick, because he (unfortunately, for us) would be small. We also decided, in our irrational and swept up state, that we were obviously ready to begin our search for the perfect addition to our family. We checked out the dogs at the humane society and didn't fall in love. Then, we went to Fuzzy Friends Rescue. We had looked over the catalog of adoptable pets and were on the search for some of our favorites when we arrived. One of our hand-selected pups, Stryker, had the same problem as Ralph--he was going to be too small. Pass. So, we made one circle around the cages, commenting on the puppies, wondering which ones would sell in person as much as in the pictures, and at the very end of round 1, I spotted him. "Reggie" as he was called in his former life, was shy and sweet and he would drag his body along the cage like a cat--it was love. We decided to take him to a "Getting Acquainted Yard." All he did was sniff. He didn't play with us too much, his curiosity getting the best of him this visit; and he would run, frightened by the little dogs next to the yard. Byron wasn't feeling it, but I knew he was the one. During this visit, we also played with Nick, a spunky dog who played with us and zigzagged through obstacles and bit my scarf. Pass. Yes, puppies are playful, but this one was too playful for me. We walked back to Reggie, and I knew. Byron returned later that day to play with him again. He texted me, "Bixby (we had already named him as well, and he totally fit the name) put his paws on me and gave me a huge hug and kiss. I'm sold." Byron filled out the adoption application. Bixby would be ours. The next time we returned to see him, Byron's phone rang as we were walking to the "Getting Acquainted Yard." I gave him disapproving eyes and told him to ignore it--it was puppy time. He answered, and it was the Fuzzy Friends office telling us we were approved to be Bixby's adoptive parents. Hooray! This was all before our Palm Desert Trip. We fit in one more visit with Bixby, and took off, anticipating our return just like the Christmas mornings I had dreamed about as a kid. Adoption day did not disappoint. We arrived as soon as they opened, ready to pick up our Bixby and become a two-dog family. Bixby is ours now, and we love him. Come back to the blog for Part 2: Adjusting to our new life with Bixby!